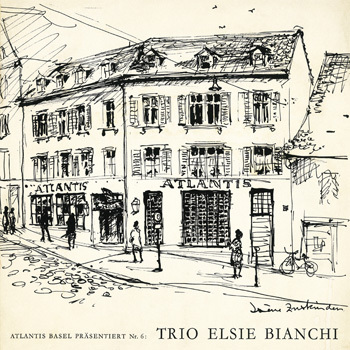 After their only regular LP-release “The Sweetest Sound” on Brunner-Schwers German SABA label in 1965, the highly talented Elsie Bianchi Trio from Zurich seemed to fade into eternity. Until the new millenium nothing else was reported except for the rumour of an odd 10inch LP pressing from some legendary recordings made in 1962 at the Atlantis Club at Klosterberg in Basel, Switzerland. 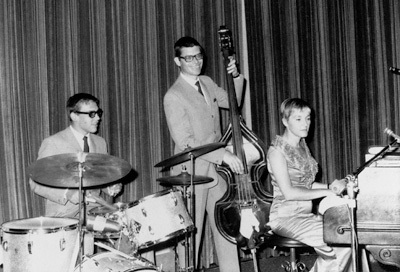 The featured tracks present their jazz music at an earlier stage - a more bluesy vain, swinging in between songs of the American Songbook made famous by the likes of Billie Holiday, Frank Sinatra, Ella Fitzgerald, The Mills Bothers or Bessie Smith, aswell as their own instrumentals “Atlantis Blues” and “Baron Lazar”. The latter resurfaced in 1964 on one of the first MPS compilations “Piano x 4”, in a polished version without Siro`s clarinet as the lead instrument. All recordings were never released for the public and the untraceable 10inch record soon had an international reputation for being one of the most wanted collectors “phantoms” instead. It was reported to be a jazz club promotional item with an estimated fifty to one hundred pressings only, being auctioned for ridiculous money in recent years, as one of the rarest European jazz recordings on vinyl. This is the first and carefully mastered reissue of this famous vinyl record in its original format and with original layout and artwork by Swiss painter Irène Zurkinden. Enjoy! How did you start making music and became a jazz pianist? We were six children – one sister, four brothers and me. Our mother wanted all of us to learn music and our first instruments were accordions. I already played concerts at the age of five within the so called Swiss evening entertainment. In 1946 we all were invited to Paris for taking part in the International Accordion Competition where my brothers and sister made the first prices in their category. I started piano lessons at Zurich conservatory but gave up after one or two years for an obvious reason: My brothers bought all the American records they could find. And it was difficult at that time! We listened as often as possible and I think this is how I learned jazz because there were no corresponding schools in Switzerland. My brothers played trumpet, saxophone and various other instruments while there were all kinds of musicians coming to play with us. How did the Elsie Bianchi Trio come to life then? Later in my 20ies we had jam sessions going on in Zurich and that`s how I met Siro. He played tenor & clarinet. The first jazz festival in Zurich these days was a big attraction - they kept it going once a year and had regular recording work done by Radio Zurich. Their engineers also taped the very early trio formation with additional flute player René Nyffeler. Then Siro and I got married in 1954 when he was still playing within his sextet. We finally decided to work together in a trio format and played winter resorts or various other occasions while some radio stations invited us once a year for recordings. Where did you play in the 60s and when did you first move over to the US? In 1958, we went over for the first time, hooking up with my two brothers already living in California. Things worked well and we joined Bob Cooper and his Allstar Ensemble the same year for a session in Hermosa Beach. Moreover we became friends with Hampton Hawes, Pete Jolly and Curtis Counce. It was my brother Art who introduced us to an agent over here: Joe Glaser of the Associated Booking Corporation liked our music and booked us for many years. 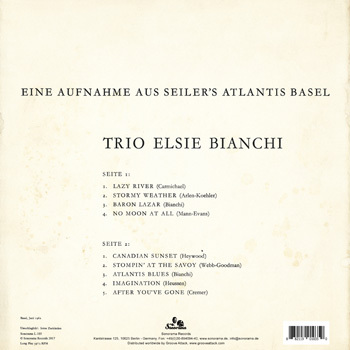 From 1962 until 1968 the trio regularly played the US from spring to fall: Miami, Fort Lauderdale, Jacksonville, Sun Valley, Lake Tahoe, Houston, Fort Worth, a few jobs around Los Angeles and even the Niagara Falls in Canada, aswell as performances at the Atlantis in Basel or a Swiss winter resort inbetween. We had Swiss drummers while performing in Switzerland and US drummers over here. What do you remember about the Atlantis recordings and your album recording for Saba? The owner of the Atlantis asked us for a recording in order to promote his club. Although we found the time to overdub several tracks, his solid tape recording was done in a few hours, pressed on a ten inch record in an estimated edition of 50 to 100 copies and solely handed out to friends or local radio stations. The same with the additional EP on which Fritz “Shorty” Staehli played the drums, it had no regular label or distribution. Then soon after the start of our Atlantis performances, the trio was introduced to piano player Waldemar Heidepriem who was a friend of Mr. Brunner-Schwer from Freiburg. He finally came over to listen to the trio in Basel, liked it very much and wanted to do a record. That was the birth place of our only album release “The Sweetest Sounds” on the Saba label. How and why did the trio finish its musical career? In 1968 the owner of the Chateau Fleur De Lys in Atlanta offered us a longterm contract. We bought a house in the outskirts of Atlanta and worked this club for almost ten years. Then Art started to manufacture tennis shoes in California and suddenly decided to build a second factory outside of Atlanta. That`s how Siro and longtime trio drummer Peter Brunner found a new task in the California factory in order to manage the Georgia plant. We jazz musicians all worked in the shoe business then until the factories were sold in 1987! producer (for reissue): Ekkehart Fleischhammer.